Dyeing Quail Eggs, Because Why Not? Easter was at my parents' this year and I was absolutely categorically told not to bring anything so ... I pretty much ended up ignoring Easter at my house. 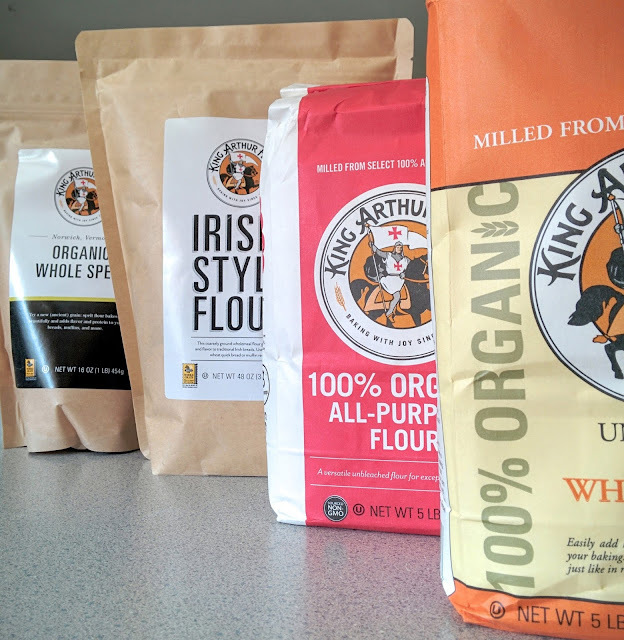 No lamb, no ham, no beets, no dyed eggs. 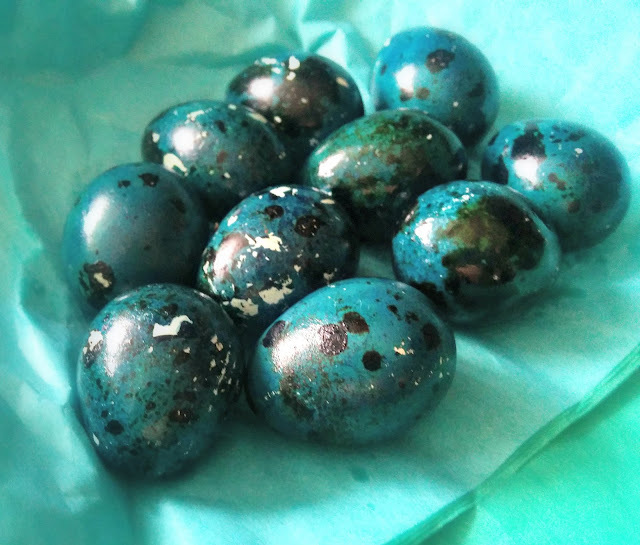 Well, no eggs deliberately dyed Easter. 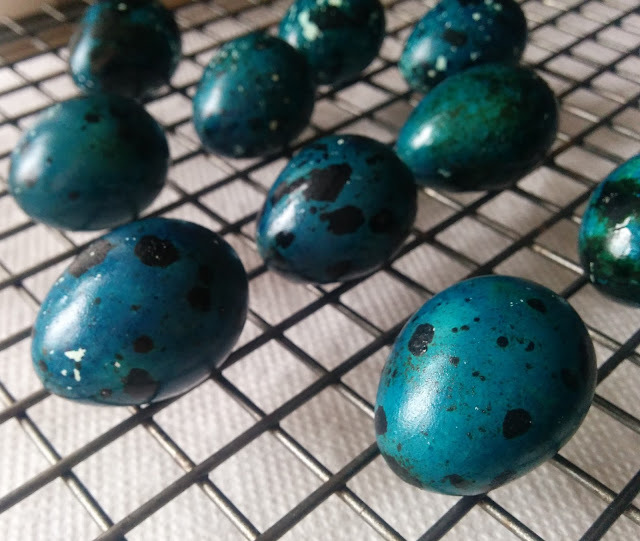 I did dye quail eggs, because I wanted to know if I really good (Pinterest said yes, but Pinterest can be full of lies). After, getting The Husband's immigration status squared away (biometric screenings, hurrah!) on Good Friday, we ran a bunch of errands, ending at A Dong Supermarket in West Hartford. We'd never been before and rather ran amok Buying. All. The. Things. And I need to go back. With a list, now that I know what they have, and take advantage of their cheap, but beautiful produce. I did pick up a half dozen Chinese pears (carefully selected whilst The Husband tried to attack me with a dragon fruit ... why was I so worried about his immigration status, again?) and 1½ dozen quail eggs. I adore quail eggs, but have only ever seen them before at the local farmers markets where they are generally too dear for frequent purchase. But these were cheap (relatively speaking) and it had been soooo long since I'd had any -- hard-cooked quail eggs, shelled and lavishly peppered, are perfectly snackalicious -- so I bought them. Only one carton. Which I immediately regretted upon arriving home. Why not two, self? Why? To hard cook the eggs, I put them in pan and covered them with cold water. Then I covered the pan and brought it to a boil. As it approached a boil, I gently stirred the eggs to try to center the yolks (still not sure this worked, but I read it on Pinterest and it didn't do any harm). As soon as the pan came to boil, I turned off burner and remove the pan from heat. I left it, still covered, off heat for 3 min. Then dye the eggs, I combined ½ cup hot water (from the egg pan), ¼ cup white vinegar, and a liberal amount of blue food coloring in a deep bowl. I gently added the eggs and let them sit for 5 min, then I removed the eggs to a a cooling rack and let them dry. When they were dry, I rubbed with a little canola oil for shine. Overall, I think they're adorable. A few of the eggs shells showed calcification (the white deposits) and those spots wouldn't take the dye, but I think that just added to its funky faux rustic look? This is Hedwig. 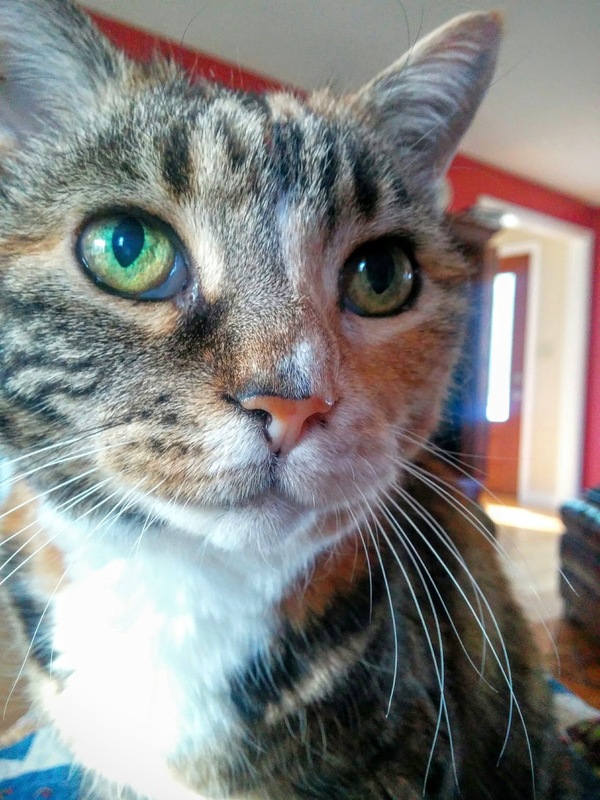 Quite possibly the grandest calico in the whole wide world. Transported to Australia for trying to swindle a young gentleman, Mary Jebb eventually escapes the nightmarish hellhole that is the Australian penal colony system, makes her way back to England and reinvents herself as Peg Blissett and find work in the kitchen of the young matron, Grace Croxon. Grace’s husband, Michael, is the brother of the gentleman Mary Jebb swindled. He married Grace for her huge tracts of land, which he intends to raze and build a mill upon. He doesn’t love Grace. Indeed, he barely seems to tolerate her and spends much of his time at “his” mill or the local inn. No wonder then that Grace, very naïve and lonely as she is, becomes quite attached to her new cook. Who has, quite probably, some rather terrible plans for Grace. If you’re a fan of the BBC dramatization of Sarah Water’s Fingersmith or ITV’s The Fortunes and Misfortunes of Moll Flanders, I think you’ll enjoy reading this book. Mind you, it is a definite chunkster and the story is unevenly paced – it seemed to take forever to get going and then it felt as if Bailey was trying to pack enough action for two novels into the last third of the book. Even though I went back and reread a few chapters, I still feel I didn’t adequately grasp some characters’ motivations or actions. 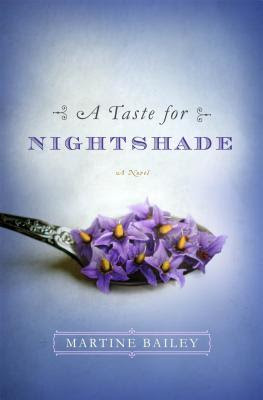 This made the big, Gothic “sturm und drang” type moment at the mill a little less thrilling for me than it might have been otherwise because I was left asking “but why?” Overall, though, I found A Taste for Nightshade to be a hugely enjoyable novel and I will be reading Bailey’s first novel, An Appetite for Violets, which also features a cook, receipts, and a murderous conspiracy! Tilapia again! 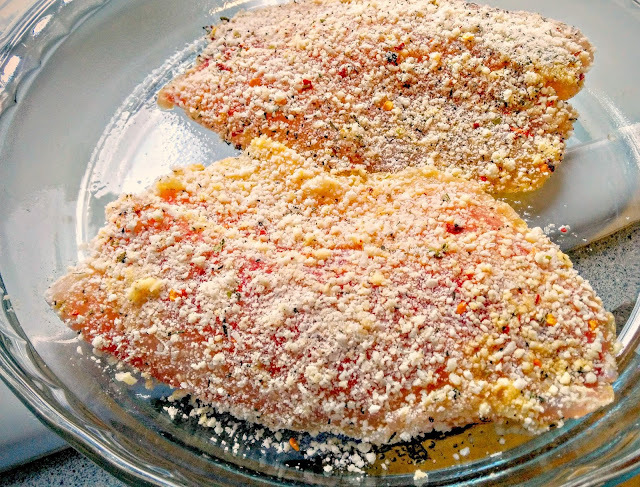 Crusted with cheese, not bread crumbs or panko or meal, because it worked out so well with Taste of Home's "Parmesan Fish Fillets." Because I was using Parmesan, again, I went with Italian seasonings. I used Penzeys "California" crushed red pepper flakes expecting them to taste similar to the ones I'd bought at the grocery store, but these "medium hot" flakes quite surprised my unsuspecting tongue. Astonishingly, The Husband really enjoyed the tilapia and didn't seem to notice the heat at all! Perhaps there's something wrong with my taste buds? Or his? Could ... could he have developed a taste for spice?? Preheat oven to 350°F. Place egg in a pie plate or shallow soup bowl. In another pie plate, whisk together cheese, Italian seasoning, garlic powder, pepper flakes and pepper. Dip fillets in egg, then lift up and allow excess egg to drip back into pie plate. Dip eggy fillets into cheese mixture, pressing fillet down firmly for an even coat. Place in a greased quart (9"x13") sheet baking pan. 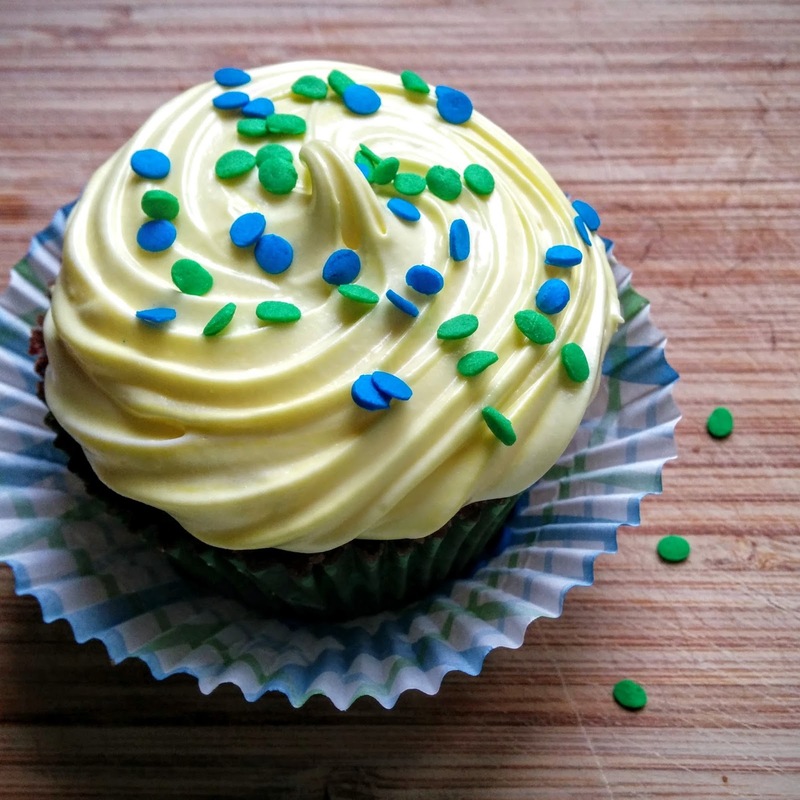 Bake at 350°F for 15-20 minutes or until fish reaches 145°F and flakes easily with a fork. The mashed potatoes came from the fried chicken place down the street which has become my go to stop for supper sides when I'm feeling too low to toss a salad or boil potatoes. They make the best fried chicken , yes, but their mashed potatoes and tossed salad are pretty darn fine. I overcooked the carrots a bit, because I was reading a book while cooking (I know! I know!) 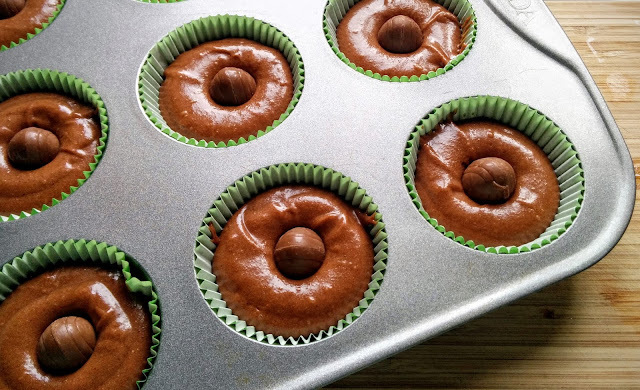 and they came out a bit too squishy for my taste, but The Husband thought they were lovely! Sometimes I pick up a book and it’s just pure, unmitigated fun from beginning to end. The Unbeatable Squirrel Girl is exactly like that. Although Doreen is quite earnestly out to do good, she is not a Serious Hero with a Dark, Tragic History. No, Doreen is a confident, happy-go-lucky college girl with a more "average" body and face than, really, I’d ever expect to find on a Marvel hero. 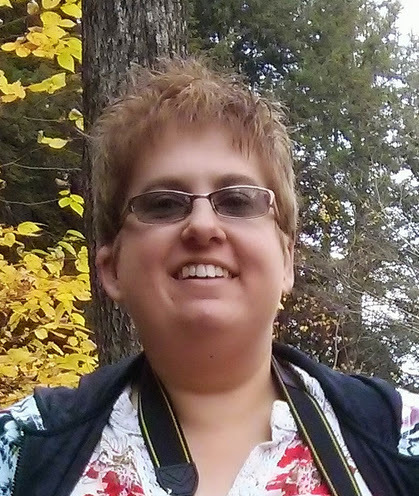 Her story is light and fast-paced with lots of silly, tongue-in-cheek humor. The artwork is in perfect keeping with the story’s tone, being very cartoony and bright. It looks like a cartoon I’d want to watch ... why isn’t there a cartoon, anyway? I totally loved that Doreen, while she really seems to crave the respect and accolades of the Avengers, is set on forging her own unique identity as a person and as a superhero. This doesn’t mean she dons a mask and stalks the city by night, in search of injustice. No. Doreen’s plan is actually quite sensible -- enroll in a computer science course at Empire State U (women in STEM, hooray), master her own unique squirrel-based superhero skillset, and create a memorable theme song, among other things. She’s set on becoming the best self she can be and it’s so fun and uplifting to watch her go about it. When I started reading, I was so focused on the story and art that I missed the first few footnotes. You don’t want to miss the footnotes as they are very amusing! As are the letters columns. And “Deadpool's Guide to Super Villains” trading cards. And Nancy’s knitting posters (I’d buy them if Marvel sold ‘em). Oh, Nancy herself is just all sorts of marvelous, too! 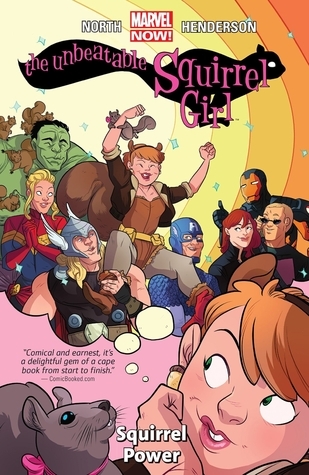 In a nutshell, pretty much everything in The Unbeatable Squirrel Girl is marvelous fun and I look forward to Volume 2. 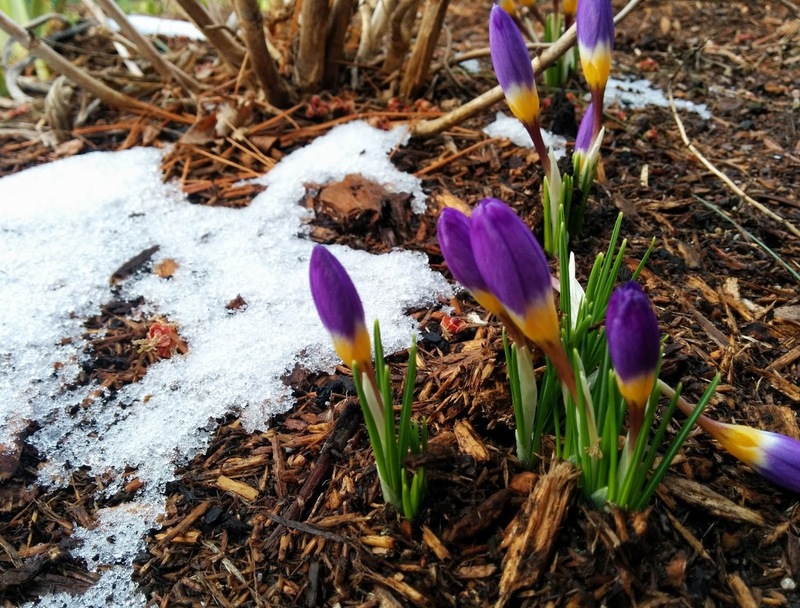 A little snow never stopped the crocus! Fell down the rabbit hole that is the Internet again one afternoon and, in a long and roundabout way, eventually came to an old article, “Invisible Ink: No 216 - Anna Katharine Green,” from The Independent. Anna Katharine Green, American poet and novelist who may be called the mother of the detective novel. Her most famous novel, The Leavenworth Case, was published in 1876 which snuggles in quite nicely between Wilkie Collins’ 1860 detection novel, The Woman in White, and the first print appearance of Sherlock Holmes in 1887. The Leavenworth Case is a classic locked room (Manhattan mansion, in this case) murder mystery focusing on the death of a wealthy, prominent New York merchant. Suspicion falls on his two nieces, one of who stands to inherit a pretty packet. Alas, I could not immediately find a copy of The Leavenworth Case in my library system. I do have a copy on hold, but delivery being as it is right now, I do not expect it before May. I could read the Project Gutenberg copy, but I want to hold a proper book. Ridiculous as it sounds, I prefer to read books written before 1920 in a physical format. It just feels more “right.” It as an affectation, I know, and a weird one at that. Anyway, I did find a collection of Green’s Violent Strange stories on CD. Produced by Tantor Media and read by Shelly Frasier (my most favorite audiobook reader of all time), Mystery Stories of Violet Strange includes all nine Violent Strange stories -- "The Golden Slipper," "The Second Bullet," "The Intangible Clue," "The Grotto Spectre," "The Dreaming Lady," "The House of Clocks," "The Doctor, His Wife, and the Clock," "Missing: Page Thirteen," and "Violet's Own." So who is this Violet Strange? Violet, in addition to have the best name ever for a detective, is a pretty, young New York debutante who has to keep her detective work on the down low, because much of her skill at detection is based upon her intimate knowledge of behind-the-scenes upper-class New York and her ability to innocently be welcomed into places and situations a male (detective or otherwise) could not so innocuously enter. Yes, so Violet plays her gender and class cards pretty hard ... but in a way I found deliciously subversive. To the greater world she seems inconsequential -- a “silly little chit” and “that airy little being.” But in truth, Violet is cunning, poised, and entirely sure of herself. Violet isn’t detecting merely for detecting’s sake -- although it’s clear she enjoys her work -- she has a clear goal in mind and that goal is to support her sister, whom their father has disowned, through her own agency and enterprise. Unsurprisingly, I was complete smitten with Violet. 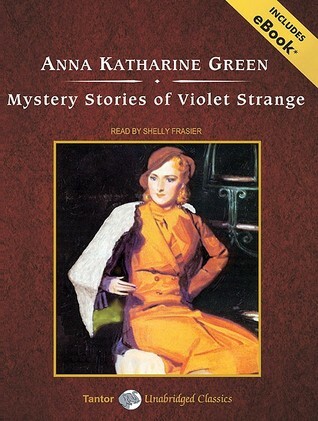 The stories themselves are very much products of their time, but I think if you enjoy Edith Wharton’s short stories or Wilkie Collins’ more thrilling pieces, you’ll find some pleasure in Mystery Stories of Violet Strange. My favorite was probably the second story “The Second Bullet,” in which Violet is hired by a widow whose husband and child were killed in what the insurance company calls a suicide, but what the widow is sure was a murder ... and she really needs it to have been a murder, because she’ll be left absolutely destitute otherwise. It’s a classic locked room mystery with a very realistic look at marriage and the strain an infant can add, as well as the precarious financial/class position a single woman (widowed or otherwise) occupies. 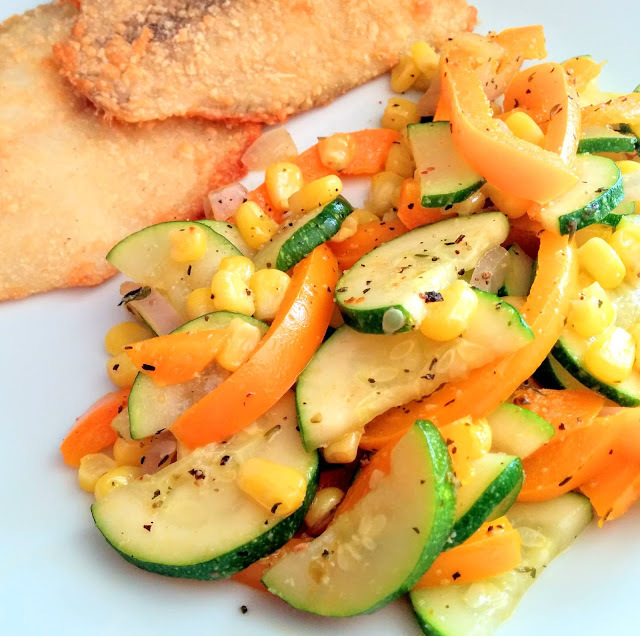 Made this yummy baked tilapia and zucchini medley last week for supper as part of my continuing quest to Eat. 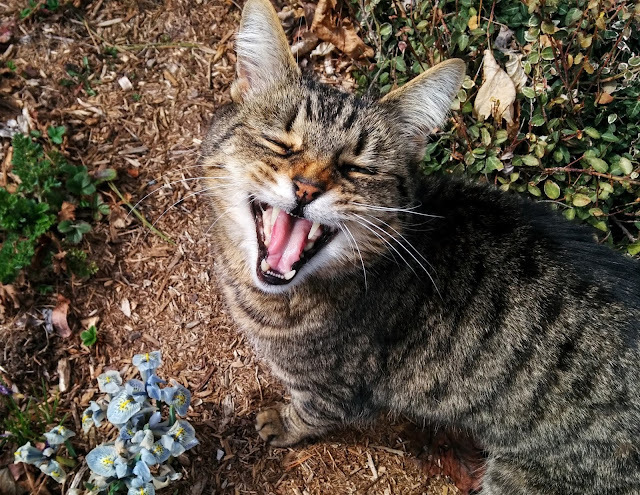 Moar. Fish. 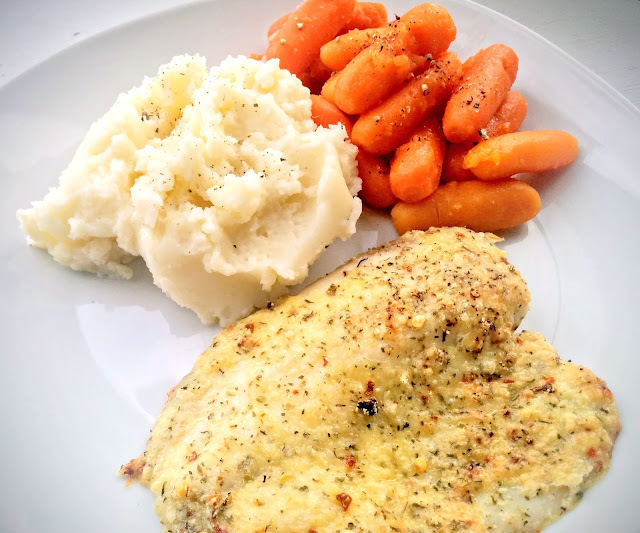 It's a mild, sweet, white fish so The Husband tolerates it well and I find it's pretty versatile, so I don't mind cooking it. But I'd really love some cod. Dear Heaven, cod. Too fishy for The Husband, though! So I limit my "weird" fish (hello, trout!) eating to when we dine out and limit home cooked fish to "acceptable" fish like salmon, tuna, and tilapia. And this is quite nice tilapia, I do admit. I followed Taste of Home's recipes for "Parmesan Fish Fillets" and "Zucchini 'n' Corn Sauté" with a few tweaks (white whole wheat flour instead of all-purpose, roasted garlic powder instead of garlic salt) but not enough to change the dishes in any significant way. 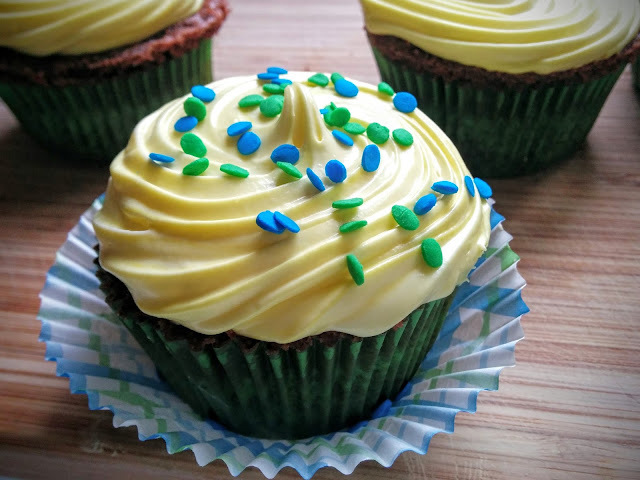 They're both easy recipes and pair together well both in flavoring and timing. 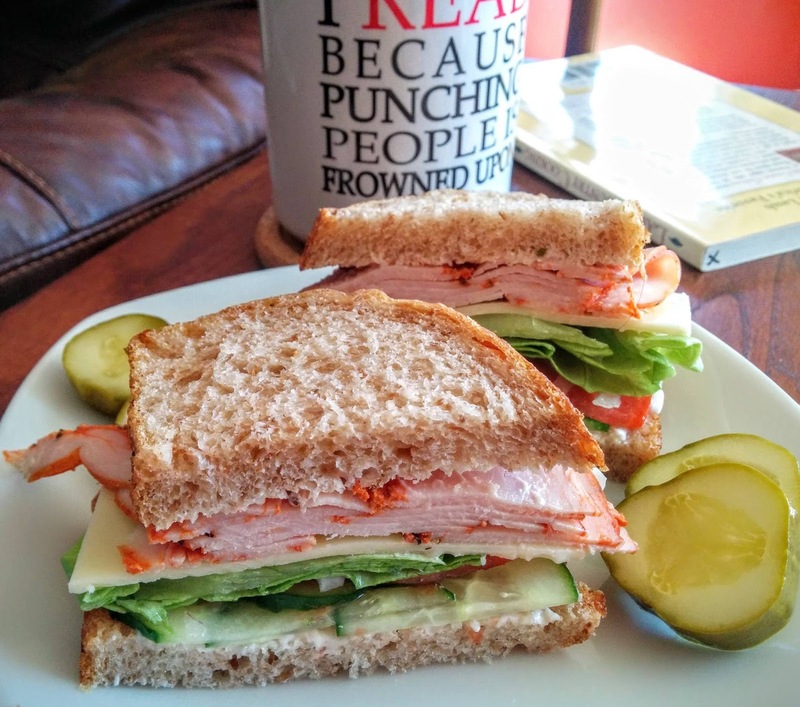 I'd definitely make them both again -- especially in the summer, when the vegetables are fresh from the garden. Even with out-of-season vegetables, the dish tasted fresh and summery. The colors are fabulous, too. The fish is moist and flaky with the parmesan crust giving it a little bit of crunch. So. Here. 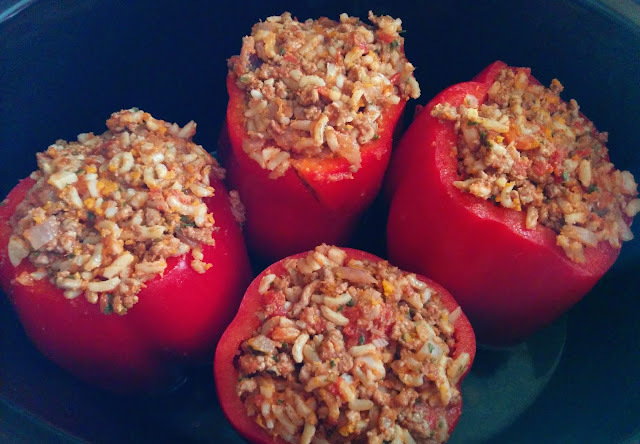 "Greek Style" slow cooker lamb and rice stuffed peppers. They're mixed together all higgledy-piggledy and stuffed in a pepper. It doesn't get much more "and" than that, does it? When I made these peppers the first time, I cooked them on High for 4 hours and that was too hot too long as the peppers just disintegrated when I tried to remove them from the slow cooker. They were delicious, yes, but not very nice to look at, so I tried them again on Low for 4 hours and they were, while clearly cooked, firmer. Unfortunately, I only took pictures of the falling apart fail peppers, so you will just have to believe me! And the falling-apart-peppers were delicious -- like very sweet roasted peppers -- just rather messy and unpretty. 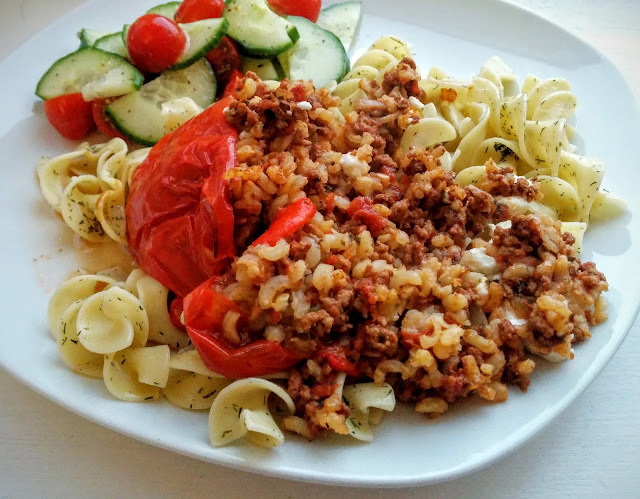 Flavor-wise, I use crushed tomatoes, onion, garlic, Greek seasoning blend and cinnamon to try to create a filling that tasted something like the meat-and-rice stuffed dolmades I buy at the local Greek festival. The goat cheese is just there because it seemed like a good idea, but it's not really necessary and can easily be omitted. Or, maybe, just stir the cheese into the meat and rice mixture before you stuff the peppers? Also, while you certainly could make rice for this dish, I just used brown rice leftover from Chinese takeout. It was a bit clumpy, so I crumbled it between my fingers to break it up as I added it to the skillet. Trim tops off bell peppers. Remove ribs and seeds. Set aside. Heat a large skillet over medium-high heat. Add lamb and cook until no pink remains. Remove lamb from skillet to a fine mesh strainer or colander set over a large bowl and let fat drip through. Meanwhile, add onion and garlic to empty skillet and cook, stirring regularly, until onion softens and garlic is fragrant. Add drained lamb back to the skillet along with the tomatoes, rice, seasoning blend, and cinnamon. Set aside. Stuff peppers with lamb mixture and arrange in slow cooker. Pour broth AROUND peppers. Cook on LOW for 4 hrs. Remove lid. Sprinkle tops of peppers with goat cheese. Cover and cook for another 10 minutes. With canines like those, I have to wonder if my cat is also a vampire. Earlier this week, I'd picked up quite a large piece of surprisingly cheap salmon and an equally cheap bunch of asparagus that looked just too good to pass up. Of course, I didn't have a plan when I bought them and while I briefly entertained fantasies of puff pastry and Beurre blanc, I knew such things were never going to come out of my kitchen on a weeknight (or ever, probably). In the end, I went with a tried and true (if completely unfancy) method and roasted everything in the oven. 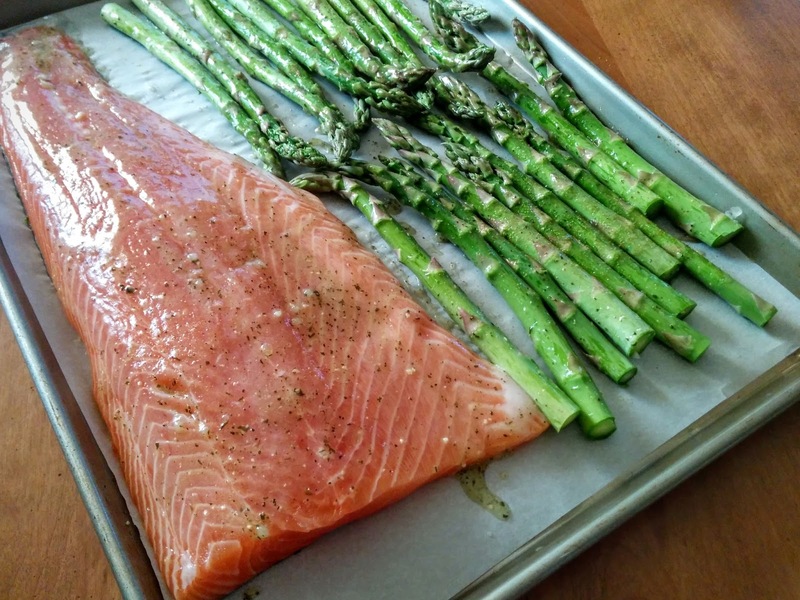 Roasting salmon and asparagus is fast, easy, and yields reliably delicious results -- just what I need on a weeknight. 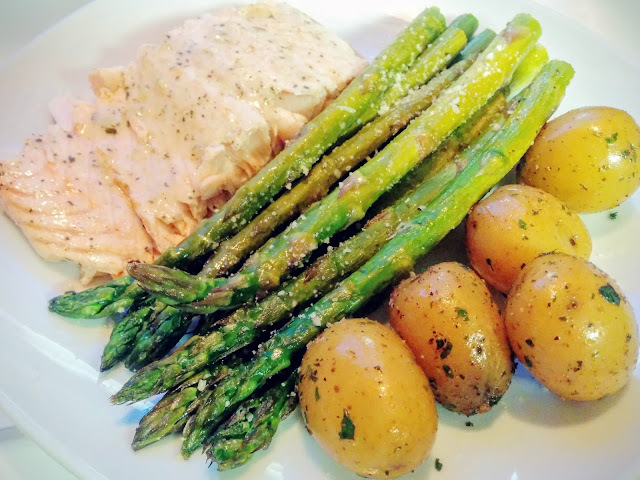 I didn't note how much the salmon or asparagus weighed before I cooked them so there are no weights for them in the recipe below. Certainly, it made more than two people could eat in one meal, but leftovers are always fab on salad or mixed in with scrambled eggs. Wash asparagus, pat dry, and break off tough ends where the stalks snap easily. Pat fillet dry and place it on the parchment. Put the asparagus alongside. Whisk together olive oil, lemon juice, and seasoning blend. Brush salmon and asparagus with the olive oil mixture. 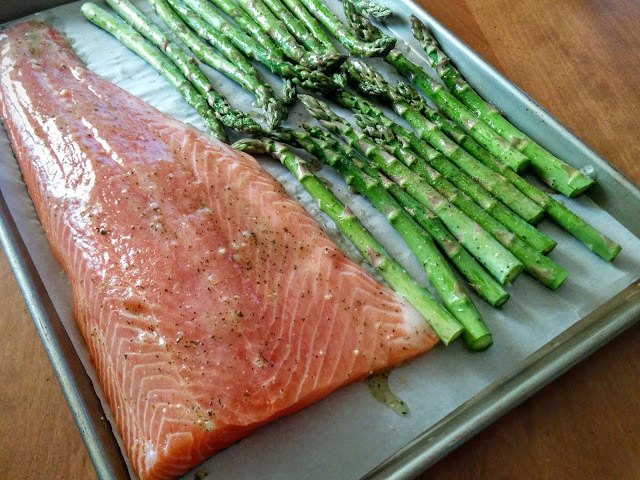 Pop pan in the oven and roast for 15 minutes or until salmon reaches 145°F, flakes easily with a fork, and asparagus tips have begun to brown a little. Sprinkle the asparagus with Parmesan and black pepper, if desired. Serve.